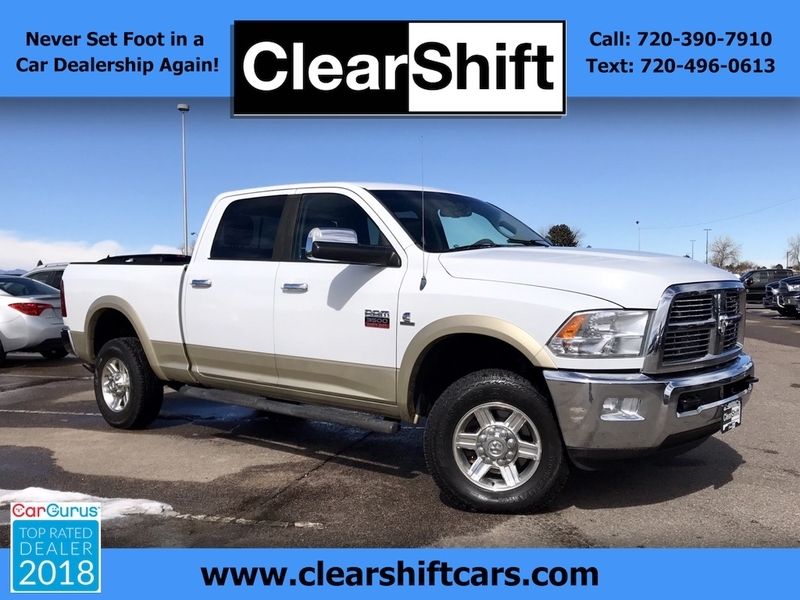 Meet our 2011 Ram 3500 Laramie Crew Cab Dually 4x4 shown off in Bright White Clearcoat. Powered by a TurboCharged 6.7 Liter Cummins Diesel 6 Cylinder that offers 350hp while matched with a Heavy Duty 66 Speed Automatic transmission for easy towing tasks. This Rear Wheel Drive powerhouse will help you maximize your load with minimal squat and still be a manageable vehicle that can tug your workload or your boat with ease. A walk around the outside reveals rear sliding window, alloy wheels, and privacy glass. With our, Laramie trim you are treated to added luxuries such as leather heated/cooling front seats, full power accessories, wood grain inlays, a fabulous sound system, turn-by-turn navigation system, leather-wrapped steering wheel with controls at your fingertips, and more. This is the perfect workhorse that can easily pull double duty at the country club too. The safety list rom Ram includes ABS, 4-wheel disc brakes, the backup camera, plenty of airbags, and child safety locks, just to name a few. Stop in today and see this awesome Ram 3500! Print this page and call us Now... We Know You Will Enjoy Your Test Drive Towards Ownership! WE SHOW BY APPOINTMENT ONLY! PLEASE CALL OR TEXT (720) 390-7910 NOW TO SCHEDULE! WE ACCEPT ANY TRADE. WE ARRANGE FINANCING WITH ALL MAJOR BANKS AND CREDIT UNIONS. Passed Rigourus Inspection,, Top Safety Pick,, Professionally Detailed,, Very rare,, All Recommended Maintenance Preformed by Previous Owner,.